Roll dough until 3 mm thick and store in refrigerator. When cool, crumble, add to mould and bake. Mix together pear cubes, apple cubes, Williams pears, Toque Blanche pear nectar, cinnamon, tonka beans and vanilla, and heat in microwave. Mix together with honey in saucepan, and add sugar, trehalose and pectin. Add yuzu puree and calvados. Make caramel with sugar and glucose. Deglaze with heated cream and emulsify. Add butter, pour onto chocolate and emulsify. Make pastry cream with milk, cream, egg yolks and cake flour. Hydrate gelatine powder in 49 g of water and add. Make Italian meringue with egg whites, sugar, 22 g of water and stabiliser. Mix gently and pour into mould. Pre-crystallise chocolate and pour into mould. Pipe caramel ganache onto chocolate sablé. Place moulded poire pomme sauté and chocolate chiboust on top. Caramelise surface of chocolate chiboust. 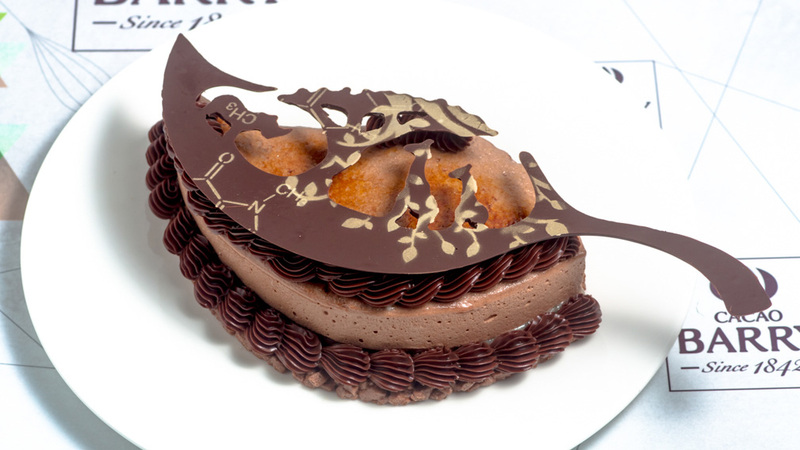 Pipe caramel ganache on top and place chocolate decoration.